I always had a vague interest in crafts like knitting and crochet, but it never went further than this interest. At school we never learned it either, so it wasn’t a very prominent interest. This remained so until I discovered amigurumi in 2009. Amigurumi is a Japanese word formed from 2 other words. The first word “ami” (from the verb “amu“) means knitting or crochet; the second word “nuigurumi” means stuffed toy. 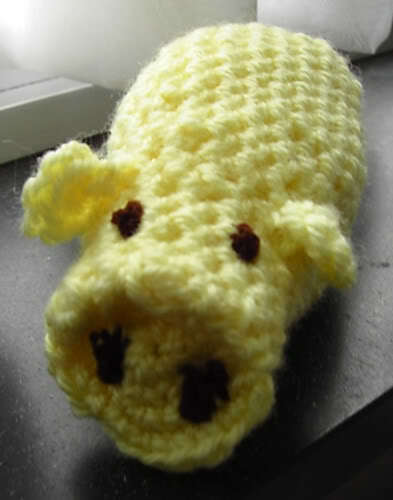 So amigurumi are knitted or crocheted softies. Generally speaking, amigurumi are super cute or, like the Japanese say, kawaii. The more I learned about these cute, crocheted animals, the more my fingers itched to learn this too. Of course, I first needed to learn how to crochet and this I learned through YouTube. Yep, YouTube truely is a phenomenal place to see detailed video’s for several different crochet techniques. More details on how and where I taught myself to crochet can be found here. After a lot of practising, failing and more practising I finally managed to produce something recognizable. And what is the best way nowadays to share something with the world? Yes, through a blog. After some thought I created a blog at WordPress.com: charami.wordpress.com. On this blog, I wrote about my crochet experiences in English. But then I had an idea to share Dutch (my native tongue) translations of patterns and I found it a little bit strange to post these on a blog mainly written in English. So I decided to create a second blog, Charami NL, in which the NL stood for Nederlands, which is the Dutch word for Dutch ^_^. Initially, this Dutch blog was only used to post pattern translations, translation schemes and tutorials in Dutch, but after a certain amount of time I started to blog more on the Dutch blog than the English one. This was probably due to the higher response rate on the Dutch version 😉 . And then came the idea of owning my own domain. To no longer be dependent of WordPress, but have an own site, with my own space and everything I want. And here enters charami.com. Wait, what? You say this site is called english.charami.com. So look around, and if you have any question or request, you van always leave a message or contact me through the contact form. Have fun and thank you for your visit!